Aveda creates high-performance, botanically based products for beauty professionals and consumers worldwide while continuously striving to conduct business in an environmentally sustainable manner. Headquartered in Blaine, Minnesota, Aveda manufactures innovative, plant-based hair care, skin care, makeup, and lifestyle products, available in Aveda Experience Centers and more than 7,000 professional hair salons and spas in more than 30 countries. Aveda first introduced 4MAT as a tool for educators within the Aveda Institutes' cosmetology and esthiology schools that prepare beauty professionals for licensure. 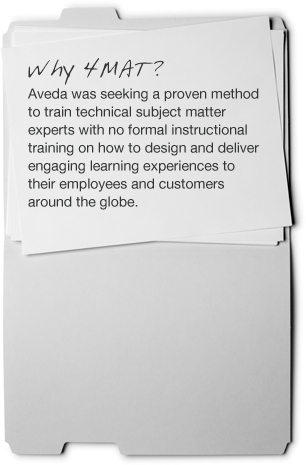 Educators at the Aveda Institutes are subject matter experts with a high level of technical skill. Aveda partnered with the 4MAT 4Business team to develop a customized train-the-trainer curriculum that would equip the educators with effective teaching skills. Research on 4MAT learning styles across industries consistently indicates a correlation between roles and learning style preferences. When Aveda assessed the Institute learners with the 4MAT Learning Type Measure, the results indicated that the vast majority preferred the Type 3 and Type 4 learning approaches. Based on this insight, the Aveda team focused on designing a curriculum that appealed to the preferences of their audience while also addressing potential weaker areas. To do this, the curriculum design team moved learners through the complete learning cycle. "[4MAT's] ... result is a dynamic learning environment that allows learners to not just absorb information, but interact with it and apply it immediately, with the ultimate goal of helping them reach their professional and personal potential." Shelley Barnes, Executive Director for Aveda Field Education and Program Development, believes that 4MAT is essential to the success of Aveda's education strategy. "4MAT gives Aveda a consistent framework for curriculum design that engages every learning style-so each learner becomes an active participant and connects with the information in a meaningful way. The result is a dynamic learning environment that allows learners to not just absorb information, but interact with it and apply it immediately, with the ultimate goal of helping them reach their professional and personal potential," says Barnes. In-field education to Aveda customers is delivered through corporate or distributor-led education by subject matter experts. In order to create and maintain consistency in delivery, educators are required to demonstrate a working knowledge of 4MAT. As part of the rigorous educator certification process, potential educators are trained in 4MAT. Product knowledge, product launch information, technical content, and soft-skills content are all delivered to Aveda educators within the 4MAT training design, complete with visual icons that reference the advanced, eight-step 4MAT model. As a result, the instructional design team, educators, and customers use the shared language of 4MAT to convey information systematically and consistently across the entire Aveda network. To support salon/spa owners and managers in growing sustainable businesses, Aveda offers advanced business education through Aveda Business College (ABC). Each ABC course focuses on meeting business benchmarks and running a profitable salon/spa business. In ABC, learners discover their learning styles by completing the 4MAT Learning Type Measure. Once they understand their own learning styles, they are able to consider the learning styles of their team and bring the language of 4MAT back to their salon/spa and re-create the dynamic learning experiences created by Aveda. Lupe Voss, owner of Julian August Salon, completed the 4MAT certification to prepare for her accreditation as one of a select team of global technical educators for Aveda. Voss shares, "I really believe that 4MAT has made me the trainer I am today. It is the tool that every trainer can use to bring out potential in both themselves and their learners. 4MAT helps me speak in different 'learning languages' and serves as a guide for me." Understand the learning styles of your audience. When you understand the learning style preferences of your team and customers, you identify both strengths and potential weaknesses. With an awareness of the weak areas, you can better plan curriculum that supports your audience in implementing for success. This may mean that you pay particular attention to the audience's weaker quadrants in your design approach. For example, if your audience has a low percentage of learners with a Type 3 approach, you might include more action planning tools and job aids. Create consistency across all training channels. For large or global companies with many educators, consistency is essential to ensure every learner receives the same information and learning experiences. 4MAT provides a simple, effective framework that makes it easy to train and receive information in a clear, consistent way. Share the language of 4MAT with your staff and customers. Consider how your team, company, and customers might benefit from having a common language to share information.